Dragonlore, the fantasy series beginning with A Dawn of Dragonfire, continues with a new epic tale. 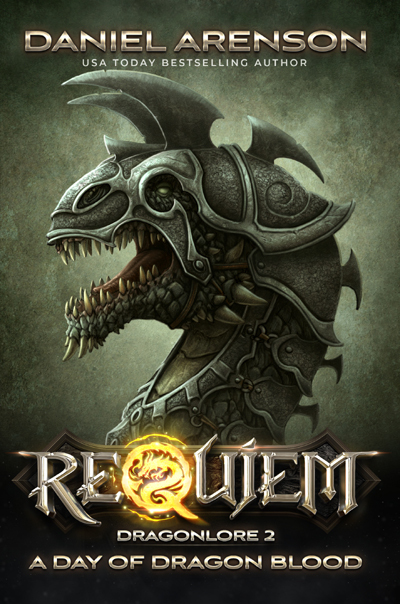 Requiem, an ancient land whose people can become dragons, lies smoldering. After burning Requiem’s halls and forests, the cruel Queen Solina retreats into her desert kingdom; there she plans her second assault. Among the dunes, Solina wakes an ancient evil buried in the sands: a horde to slaughter every last dragon. The wyverns rise from the desert, beasts of iron scales, leathern wings, and claws like swords. Myriads swarm. From their maws spews acid to eat through flesh, stone, and steel. Flying upon the Wyvern King, her sword and banner raised, Solina leads her host into Requiem. Requiem’s dragons are still healing; their wounds are fresh, their hearts haunted. How can they defeat the wyverns, creatures as cruel as the desert that bred them?